We study the impact on weak-probe spectra from the presence of a state for which the electric-dipole transition is allowed for coupling but forbidden for probing. Such is the 85Rb 2P3/2(F′ = 1) state, providing D2-line hfs transitions in Λ-configurations are considered with the 52S1/2(F = 2) and 52S1/2(F = 3) states in the role of the ground-states for coupling and probing, respectively. 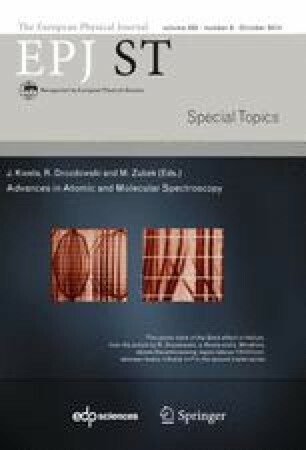 The multilevel EIT/Autler-Townes spectra were simulated with coupling field frequency fixed at various values in the range encompassing the atomic resonances. Collisionless (cold) atoms are assumed, and all decoherence rates, other than those related to the natural decay rates, are neglected. The general conclusion is that a state which is not directly involved in probe absorption can still considerably shape absorption spectra (due to multiphoton transitions), and its influence (negative for some applications) has to be carefully considered, even for the coupling-field-induced Rabi frequency values not exceeding the natural linewidth. A particular attention is paid to how the F′ = 1 state effects the narrow resonances, such as those of EIT origin or a “distant wing” of the Autler-Townes splitting, because resonances of these types are of interest, e.g., for developing quantum memory protocols [Sheremet et al., PRA82 (2010) 033838].